Can she do it is the question? Do what you ask? A small kitchen remodel on a beer budget of $2,200. This indeed will be a challenge. Today’s post I am sharing some small fluffing up for the Spring and Summer season ahead. I will also talk about some of my wish lists for the kitchen that have been a wish of mine for quite a few years. I don’t have a huge budget. Most people would chuckle at me and say you want to do all that with $2,200. In fact, I did have one contractor, be almost a little rude to me when she asked what my budget was. She told me to really do my homework and see that even the smallest of renovations can cost in the near range of starting at $5,000. I am hoping I may have the last laugh at her by the time I am finished. 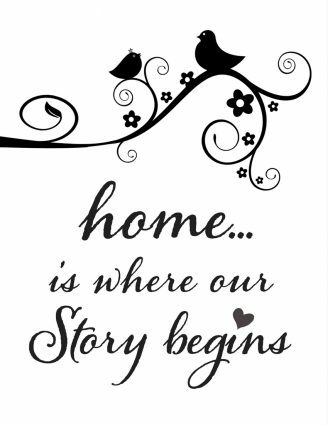 It will be 11 years in May that we are in our home. Our kitchen doesn’t really need much updating in our opinion. 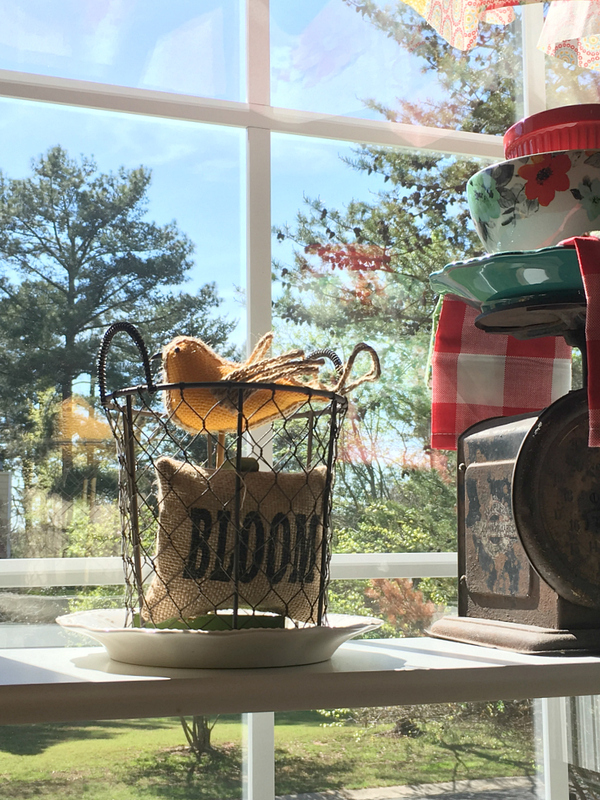 We love our Hickory wood cabinets, the granite is nice, hardwood floors still decent, new paint a few years ago HERE, we diy’ed the faux wood beams HERE, my husband built and industrial bakers rack HERE, pantry door diy HERE, and then of course my never ending curtain changes. Those are all budget friendly and mostly done with tablecloths. My last change was with Pioneer woman’s napkins. What has been on my wish list? 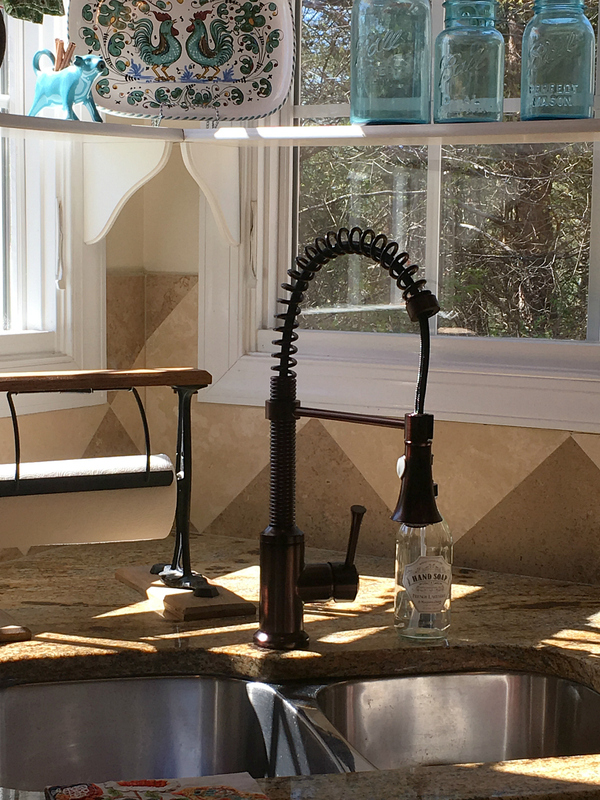 A new faucet, new cabinet hardware, a larger kitchen island, and custom decorative hood over the stove. So far, we have the new faucet and new hardware. I found this beauty at Signature hardware for $239.00. I also found some pretty kitchen hardware for under $100.00 that my husband will be installing tomorrow on his day off. That brings me to $339.00. One thing I have grown and learned throughout the years that you must shop around. Compare prices, and get at least 3 estimates to compare. So far I have had two for the kitchen island and the custom hood. Both vastly different prices. I am interested to see what #3 will come in at. One thing I do know for sure is I do not plan on being all matchy, matchy. And no plans on going white with anything. In fact, the kitchen contractor that came today actually said how refreshing it was to walk into our home and it feel warm and cozy and not all white. He said he doesn’t ever recommend white anything to his customers but a lot insist that is what they want. White cabinets and white marble or granite counter tops. He loved my roosters too HA!~ I crack up when men actually notice my rooster decor. A lot of them do too surprisingly. I will be sure to keep you updated on the changes ahead. If you want to know the curtain changes today, that simply was a Pioneer woman tablecloth that I cut. 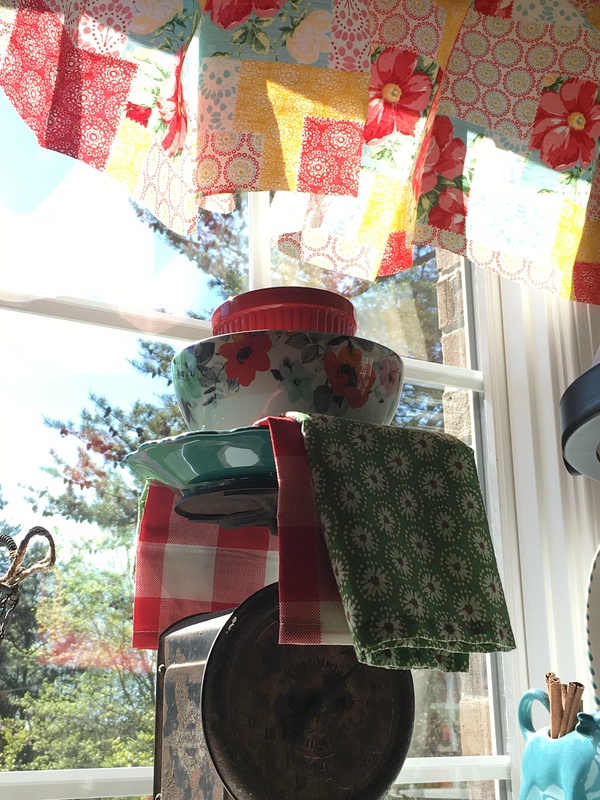 I cut two long pieces just to coordinate with my existing tablecloth curtains, and then I cut four more to hang/two and two above the kitchen sink. It sure is perky and cheerful in here now. I love looking at white kitchens lol! I LOVE your kitchen. It’s so very colorful and warm. Wish I had more counter space in mine, more room for decorative items. But we all do what we can with what we have. Ill be interested to see what happens with the decorative hood over your stove. I’d love something like that. 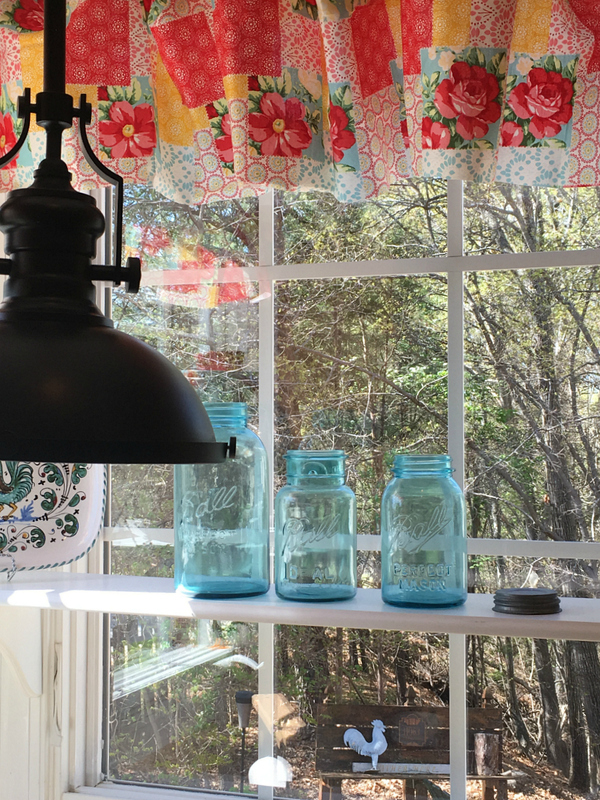 You nailed it with this tablecloth makeover! 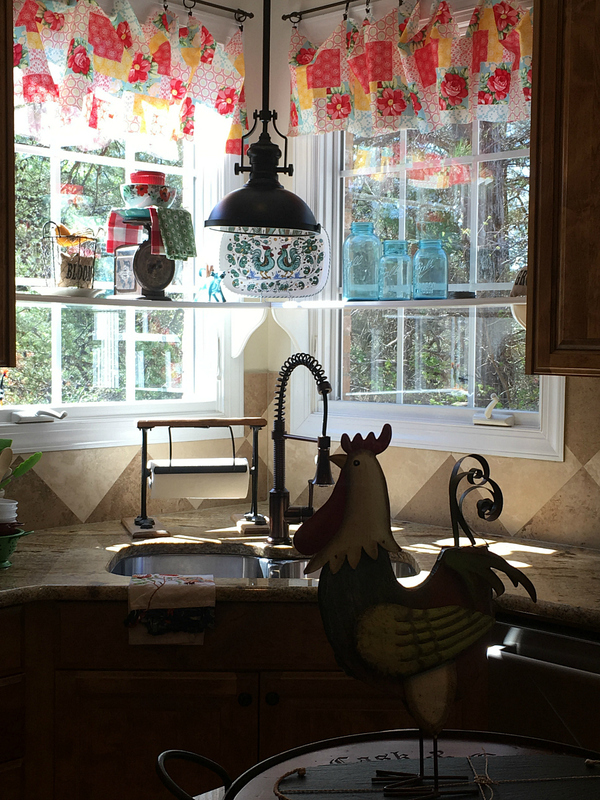 Your kitchen is warm, welcoming….beautiful Can’t wait to see your new hardware. As always thank you for sharing your diys! So glad you’re not on the “white kitchen” bandwagon. I get so tired of women on shows saying “Oh, I want a WHITE kitchen.” I painted my former kitchen cabinets white about 20 yrs ago and used them often and hard. When we remodeled our kitchen 5 yrs ago I knew I wanted a light colored cabinet but not White! We bought solid maple cabinets in the Shaker style. Loved them then, love them now. Not everyone has to be white! 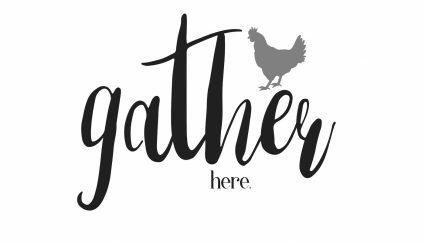 Love your roosters and the Pioneer Woman dishes! I like color! I have Fiesta dishes in red, blue, lime, and orange! Your style is just what I love. Thank you so much for sharing with us. 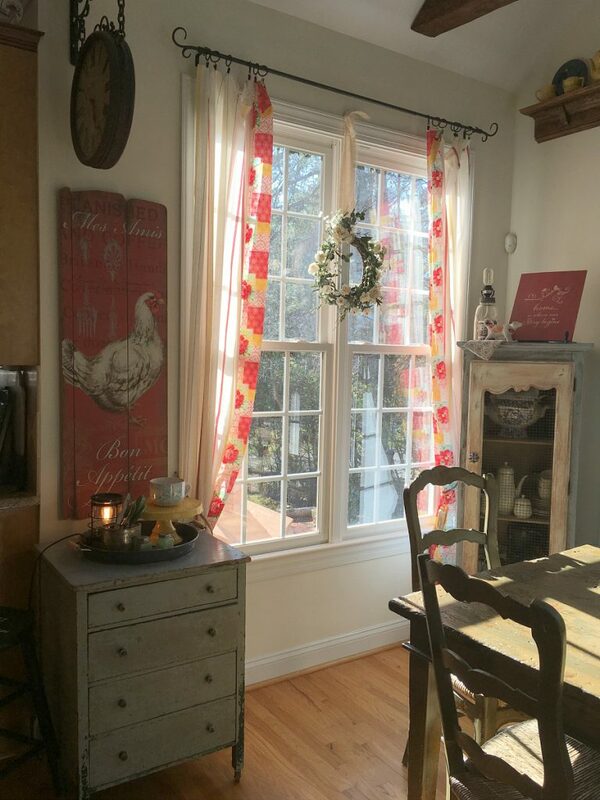 I’m fixing to remodeling my kitchen I also love pioneer woman’s table cloths for kitchen curtain s. I just can’t wait to see your whole remodeling . I’m going to start mine then. I also want to make a lazy Susan like yours with one of your stencil on it. I love the new faucet!! Can’t wait to see what else you do! Your house always looks amazing Debbie! I’m sorry Irene. Maybe try using the little scope on your computer to make it bigger. It’s pretty large font. I would love to have a kitchen like yours. So roomy and light. I have dark cabinets and I like them but with one small window and a full window back door, the room seems dark to me. And it is pretty small. I love changing the curtains on my window and door frequently. It’s a little something that gives the room a new feeling. I think your budget sounds very generous to me. I did my whole kitchen remodel including appliances, granite, paint and flooring for only $6700. So I am sure you can do your makeover on your budget. That is fantastic Marty! WOW..you did great. Love your kitchen! Could you tell me where you got your light over the sink? Love that. Or was it diyed?? 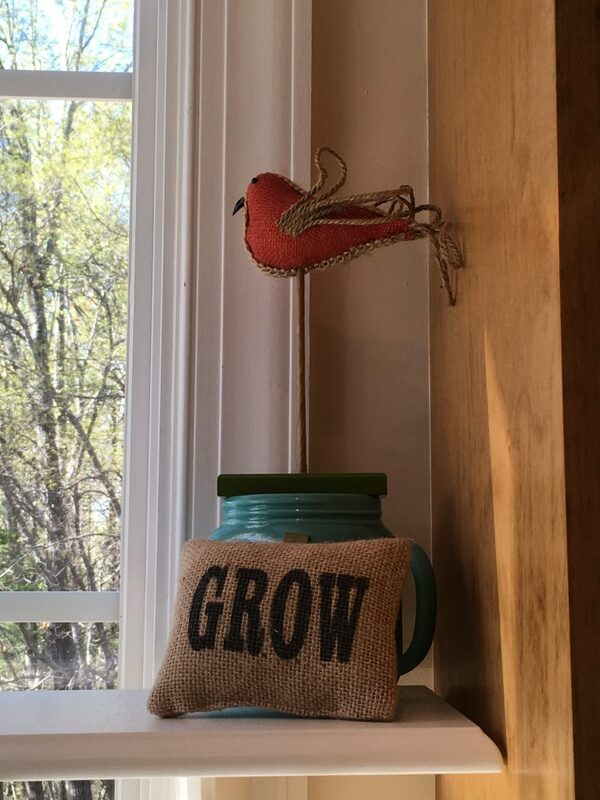 Those are burlap birds that I found at Walmart last year in their Spring section. Did you add pieces of the cut up tablecloth to the creamer draperies? 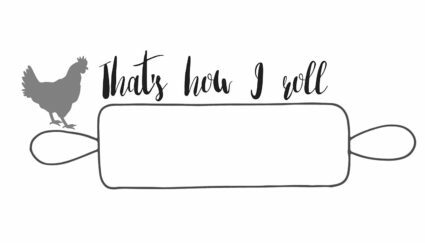 Your kitchen is beautiful and I love your blog! I love your statement that everything does not have to be ‘matchy matchy’. I SO AGREE. 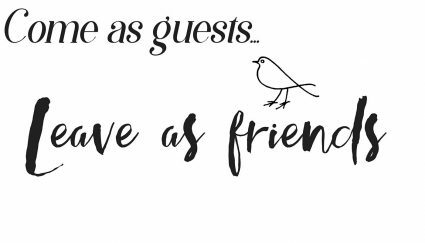 If you want that comfy welcoming atmosphere (which you definetly have)……….ya just gotta have a mixture of style, color and whimsy. Love your new faucet!! love the curtains and I would not change a thing!!! 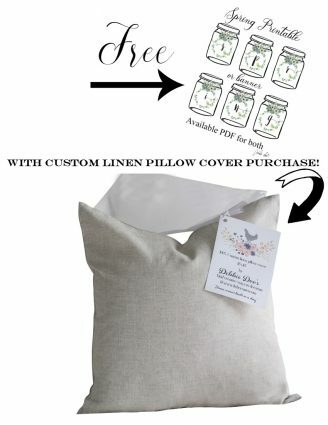 You can drape some cute dish towels on it too. Connie we found that at an antique shop. It is actually for brown paper. We used it for paper towels as you can see. Debbie, I love your kitchen. I’ve always loved colorful rooms. Not bright neon colors but warm basic colors. Primary colors? Anyway. White is okay for accent but all white?! It makes it feel like a sterile cold place to me. 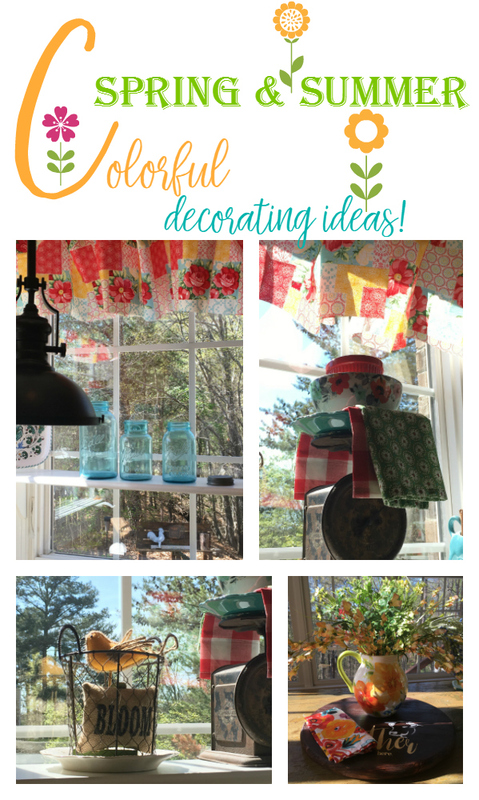 Using PW tablecloth for curtains is a fantastic idea! Just got a new PW teapot I loooove. Another winner! Love it. So cheery. I really like your kitchen, Debbie. It’s colorful and fun, and suits your personality perfectly. I would love to have a decorative hood above our cooktop, but it would mean a lot of redoing as we now have the microwave-exhaust combo….sigh. Cannot wait to see how things go on your project. Please direct me to your website of instant pot recipes. You really have a flair for putting colors & patterns together and for making everything so bright and cheery. 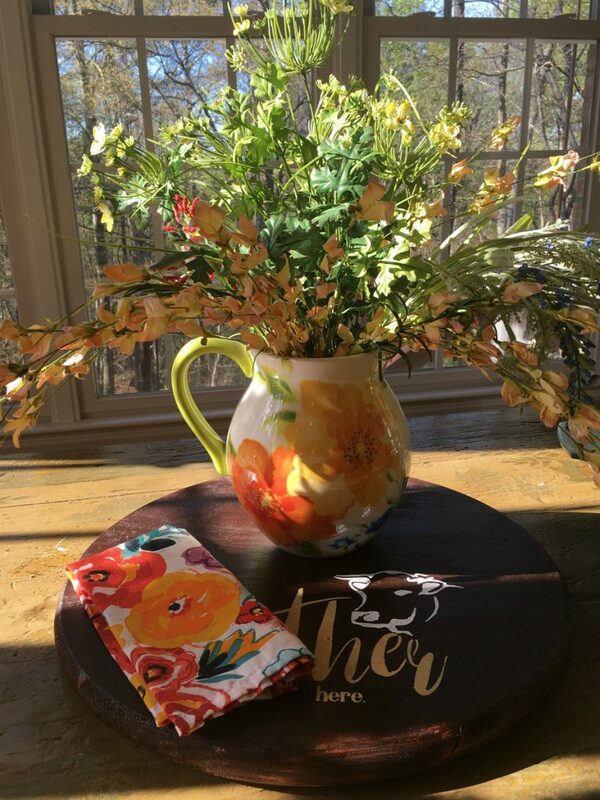 I have the Pier 1 pitcher that you show on your lazy susan and am wondering if the napkin next to it is also from the Pioneer Woman collection? Yes, that is a Pioneer woman napkin. The pitcher was a birthday gift a few years ago from a friend, and I love it!~ Thanks Jackie. So many pretty touches. I really like your new faucet. Also love that light fiture above it. I used to have a white kitchen and we recently moved and I really miss it – your contractor would cringe LOL! I love looking at blogs like yours that have updated a room on a budget. Yours is really homey – that contractor was right! I love color and warmth in my kitchen. Mine has a lot of red and earth tones. None of that “all white” everything for me either. 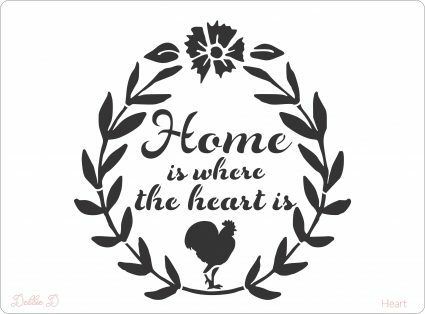 Love the roosters, too! How exciting! You put the great ideas for my kitchen inspiration, “Remodel a small kitchen with a small budget” i like it.. I love it and keep up sharing your great ideas. 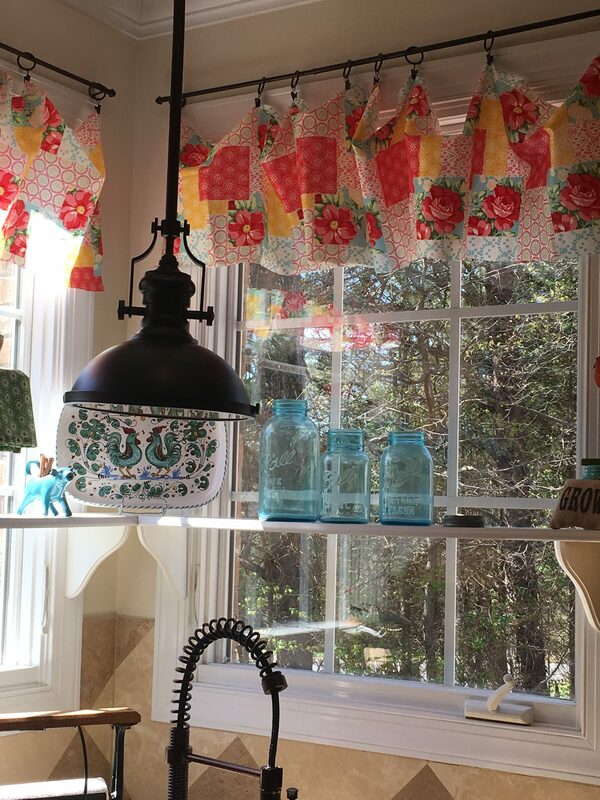 Do you sew the cut up table cloths at all before hanging them?